1st Choice Home Inspections makes it easy to schedule a home inspection, mold inspection, asbestos test, radon test, or any one of our services. You may call us at (865) 938-7575 in Knoxville or at (615) 538-7707 in Nashville and speak with one of our helpful advisers. 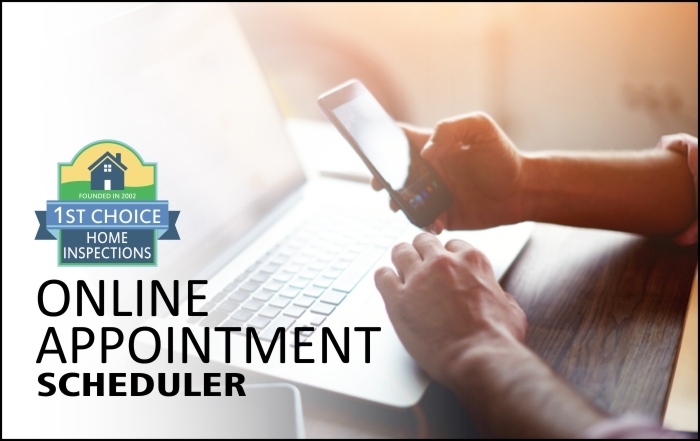 Or, if you prefer to schedule your inspection online, go ahead and use our online scheduling tool, it is easy to use. Just begin by selecting the button below that represents who you are: a real estate agent, a home buyer, or a home seller. Prices are clearly marked for each service and you have a chance to add/remove services to see what your total cost will be. We have upfront pricing, so you will know exactly how much you will pay for an inspection. And as always, we have a 100% guarantee on our services. Although our online scheduler is a shopping cart, you will not be required to pay for the inspection until the day of the inspection. Our online tool only schedules your appointment. If you need a multi-family property inspection, please call us for pricing and scheduling. Do not use our online scheduling tool. During the online scheduling process, if you cannot find an available time, please do not assume we are booked. Call us! Unfortunately, the online scheduling system does not always reflect all of our available time slots.